Bairnswear 1213: Great vintage girls vintage fair isle knitting pattern 1940s. Knitted in vintage 3ply, try modern 4ply, work tension square to see if this works better. With Britsh lions motif. To fit 7-8 years (27-28 inches chest), nice fitting rib design. Bairnswear 1250: Vintage toddlers knitting pattern from 1940s. 3 dear little cardigans, one with ducks round the bottom, one with Dutch boys and girls the other with checkerboards round bottom. Knitted in vintage 3ply to fit 20-22 inch chest. Try modern 4ply with a change of needles if needed. Bairnswear 1292: Great vintage girl's cardigan knitting pattern from the 1930s. This pretty pattern has two designs this super one with short sleeves and pandas and a long sleeved on with an all over lace design making it light and airy knitted in vintage 3ply, or modern 4ply. To fit 28-29 inch chest. or 6-8 years. Always work a tension square. Bairnswear 1305: Great vintage knitting pattern for child's cardigan with fair isle rabbit border 1940s. To fit 2-3 years or 22 and 23 inch chest. Knitted in vintage 3ply so try modern 4ply. The other little cardigan is knitted in vintage 2ply so try modern 3ply. Pretty pattern with nice easy border. Bairnswear 1307: Great vintage boy's slip over or tank top knitting pattern from late 1930s. This pattern has instructions for thee differnt designs, one with a sailor dancing a hornpie, one with alphabet blocks and a plain cable - to fit 3-4 years. The sailor one is in Sky with navy and white with touch of pink and red, to fit 25 inch chest, the ABC sleeveless pullover is a 24 inch chest in lemon with almond contrast and the cable jumper is 24 inches and says that it is just like Daddy wears! All are knitted in vintage 3ply so try modern 4ply in a tension square to get a better fit. Bairnswear 1335: Great vintage toddlers picture knit jumper and cardigan set knitting pattern from 1930s. This little set has two designs, rabbits and ducks. To fit 1-2 years or up to 21-22 inch chest. Knitted in vintage 3ply so try modern 4ply in a tension square. Bairnswear 1350: Fabulous childs soldier fair isle cardigan jumper vintage knitting pattern 1940s. This lovely pattern has soldiers on guard round the cardigan and on the yoke of the jumper, plus another set with fair isle band on both cardigan and yoke of jumper. To fit 23 - 24 inch chest. Worked in vintage 3ply, so try a tension square in modern 4ply and see if this works better. Bairnswear 1389: Super vintage knitting pattern for golly intarsia hat and scarf set 1940s. This adorable pattern is so retro with golly motifs on the scarf, mittens and hat weith long point and tassel - super Christmas gift this one. Also a fancy rib set with pull on hat. To fit 2-3 years old worked in vintage 3ply, so try modern 4ply. Try modern 3ply for smaller size or double knitting for larger size - but if you do this allow at least twice as much yarn. Bairnswear 1629: Great vintage picture knit intarsia knitting pattern for girls cardigan. This little gardigan has scottie dogs running round the bottom. There are instructions for a V neck and button through and will fit 18, 20, 22 and 24 inch chest. Knitted in double kniting yarn, but still work a tension square and change needles if needed. Bairnswear 1726: Great festive vintage fair isle knitting pattern for children. jumpers with reindeer motif and little trousers or skirt. Worked in double knitting wool, work tension to see if you need to change needles to get correct size. Work in 4ply or even 3ply for baby sizes - all the little kiddies can have a Christmas jumper using this pattern. To fit chest size 22-24 inch. Bestway 1813: Pretty 1940's vintage fair isle knitting pattern for little jumper with reindeers or scottie dogs around the bottom, just right for Christmas! To fit chest 22" or 24" 2-4 years. There are instructions for long or short puff sleeves, so cute! Worked in vintage 3ply so try modern 4ply in a tensions square and see if a needle change is needed. Bestway 1856: Super vintage little girl's cardigan with ducks at border 1940s fair isle. This V neck long sleeved cardigan has set in sleeves and sweet little nesting duck motifs round bottom. Knitted in one piece in the main part. Worked in vintage 3ply so try modern 4ply in a tension square. Not charted. Bestway1885: Great vintage baby fair knitting pattern 1940s. This little pattern is for babies cardigans with chick, floweres and check fair isle design, intarsia. Worked in vintqage 3ply, try modern 4ply in a tension square for size required, for small or new born try modern 3ply. To fit 18-22 inch chest approx. In sizes birth - 6months, 6-12 months and 12-18 months. Simple designs on a plain stocking stitch background. Bestway A2008: Great vintage cardigan with squirrel motif picture knit pattern from 1940s. To fit 2, 4 and 6 years (22,24 and 26 inch chest) in vintage 3ply which is nearer to modern 4ply, always work a tension square, charted. Bestway 2039: Great vintage boys or girls fair isle jumper with chicks 1930s. This is a super pattern and will fit 2-4 year old child, 23 inch chest. The colour suggested are red and white, but you can use any you like. Worked in vintage 3ply, so modern 4ply will work better, try at tension square and change needles if needed. Chart included and hints on fair isle knitting. Bestway 2041: Great boy' vintage knitting pattern for jumper with train border 1940s. This pattern has instructions for a little jersey with train and trucks above rib and stripes at neck and sleeves to represent tracks. To fit 2 to 4 years or 23 inch chest. Worked in vintage 3ply so try modern 4ply and change needles if needed. Instructions for long or short sleeves. Fair isle charted. Bestway A2069: Great vintage girls fair isle jumper, just like mum's or big sister's (See ladies fair isle pages) This one has a Dutch theme and comes from the 1940's. To fit 11-13 years 29"-30" Chest. This is an easy pattern an deveopes quickly whilst knitting. Vintage 3ply is used so try modern 4ply in a tension square. Blue and white is fresh, but red and white will be quite Christmassy. Bestway C2072: Great vintage fair isle cardigan with Noah's Ark design from 1950s. This lovely design for boys and girls is to fit 4-6 years or 26 inch chest and is knitted in vintage 3ply so try modern 4ply in a tension square. Colour charts. Bestway 2137: Vintage 'Tiny Tots ' twin set from the 1940's knitted in 3ply. Pictured are Bunny and Bobtail from the 'Tiny Tots' comic. To fit 3-5 years 23" -24" chest. Nice little dressed bunnie characters to please even the most modern child. Would look trendy with jeans or short skirt. Bestway 2152: Great vintage girl's twin set knitting pattern with ducks and rabbits fair isle motif 1940s. This cute pair are showing the short sleeved jumper with duck and rabbits around the bottom and the high V neck cardigan. To fit 3 to 4 years or 24 inch chest. Worked in vintage 3ply, so try modern 4ply and change needles if needed. Always work a tension square. Not charted. Bestway 2159: Great vintage knitting pattern for a jumper and cardigan with fair isle motifs from 1940s. This super set has characters from the famous Rainbow annual and comic from the 1930s and 40s. Here we have Mrs Bruin Bear and her boy Bobby Bear and Jacko the Monkey - I have several of the Annuals! The cardigan is button up and the jumper has short sleeves. To fit 3-5years and 5-7 years. Great for boys or girls. Charted. Knitted in vintage 3ply, but could well be knitted in modern 4ply with a change of needles. Jumper has buttons at shoulder. Always work a tension square. Bestway 2160: Great vintage jumper and cardigan knitting pattern with fair isle motifs from 1940s. This super set has characters from the famous Rainbow annual and comic from the 1930s and 40s. Here we have Fido the dog and Joey the Parrot-I have several of the Annuals! The cardigan is button up and the jumper has short sleeves. To fit 3-5years and 5-7 years. Great for boys or girls. Jumper has buttons at shoulder. Charted. Knitted in vintage 3ply, but could try modern 4ply - always work a tension square. Bestway 2162: Vintage knitting pattern with intarsia or picture knitting. Another cute set this time featuring Betty, the rag doll and Golly from Chicks own magazine. To fit 2-4 and 4-6 years or 22"-23" and 24"-25" chest. Knitted in vintage 3ply, try modern 4ply, make tension square first.Charted. These are from my vast collection of Bestway patterns, many more will appear over the next few months. 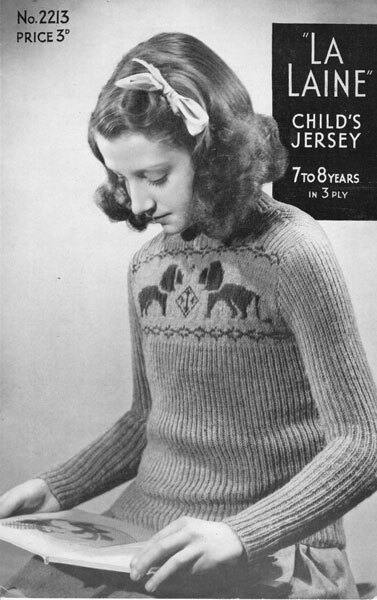 Bestway 2171: Vintage childs fair isle or picture knitting pattern from 1940'. This little jumper with a Duch boy and girl is knitted in vintage 3ply( so try modern 4ply in a tension square) 4-6 years 26" chest. Delightful to knit - very collectable. Children love these picture jumpers! Bestway 2187: Great vintage cardigan with duck border picture knit pattern from 1940s. To fit 2-4 and4- 6 years (23 and 24-25 inch chest) in vintage 3ply which is nearer to modern 4ply, always work a tension square, no charted but clear illustration provided. Bestway 2215: Great child's knitting pattern for a jumper with fair isle motif borders from 1940s. This super pattern has two designs, little dolls in national costumes or running dogs. There is a chart for the dolls but not the dogs. To fit 4 to 6 years or 24-25 inch chest. Jumper fastens at back of neck with small buttons. Always work a tension square, worked in vintage 3ply, so try modern 4ply. Bestway 2299: Vintage fair isle knitting pattern with HORSE HEAD motif jumpers to fit 8-10 years and 10-12 years or chest measurements 29"-31". Knitted in vintage 3ply, try modern 4ply. 1940's. Bestway 2315: Vintage knitting picture knitting pattern for baby. How cute is this? A twinset for a little one. To fit 1-2 years and 2-4 years in vintage 3ply, try modern 4ply for a better sizing. This little set has cats and dogs. Bestway A2670: Lovely little girl's jumper and cardigan twin set knitting pattern from 1940s. There are instructions for a short sleeved jumper with Dutch scene on yoke and the cardigan has a V neck and Dutch scene at border above rib. Windmill, boats, trees and Dutch boy and girl feature. Charted. To fit 2 to 4 years and 4-6 years - larger size gained by a change of needle size. Always work a tensions square. Jumper fastens at both shoulders with small buttons. This one may work better with modern 3ply. Bestway A2680: Great vintage baby fair isle knitting pattern 1940s. Little boys jumper and pants set to fit 6-12 months, 22 inch chest, with ducks around the bottom of the jumper. Worked in vintage 3ply, so try a tension square and chang needles or try 4ply. Bestway A2681: Great vintage knitting pattern child's picture knit with motifs 1940s. This pattern has instructions for little round neck short sleeved jumper with scottie dog, teddy or duck motifs around the bottom above the welt. Worked in vintage 3ply, so try modern 4ply in tension square and change needles to get the correct size if needed. BestwayB2742:Fabulous vintage early 1950's pattern for girls fair isle jacket. to fit 7-9 years knitted in vintage 4ply, so may well knit up in modern double knitting, work tension square on needles suggested and see if a different size is needed to get the correct size, chest 26"-28", great for Christmas gift. By adjusting wool ply and needles this could be made a size smaller or a size larger. Bestway A2827:Great little child's cardigan knitting pattern with fair isle motif borders from 1940s. There are birds in flight, cats and chickens on these little high V neck cardigans. To fit 2, 3 and 4 years or 22, 23 and 24 inch chest. Worked in vintage 3ply that should knit well to modern 4ply. Always work a tension square. Bestway A2989: Great little girl's vintage knitting pattern for cardigan with fair isle flowers 1950s. This design has a little bit of embroidery on the flowers. High V neck and set in sleeves, nice deep rib give lovely fit. Knitted in vintage 3ply that should work well to modern 4ply, but work a tension square and change needles if needed. Not charted. Bestway B3009: Lovely vintage knitting pattern for girl's flower bordered fair isle cardigan from 1950s. This pattern is for a button up cardi with set in sleeves and nice deep welt. The fair isle roses are not charted. To fit 2-4 years or 23-24 inch chest, with a tension that should work well with a modern 4ply. Always work a tension square. Bestway B3292: Great vintage babies fair isle jumper knitting pattern 1950s. This is a lovely pattern with three different designs, dogs, chicks and flowers and in double knitting yarn. To fit 1-2 years (21-22 inch chest and 3-4 years 23-254 inch chest.Easy to knit raglan jumper for a tiny tot. Bestway 3600: Great vintage jumper suit for little boys knitting pattern from 1950s. This design has instructions for the fancy rib jumper with fair isle motif of stylized Greek horse and little plain stocking stitch shorts. To fit 1-2 years or 20-22 inch chest. Knitted in quick knit that should knit to a modern 4ply according to the tension. Bestway 3619: Lovely colourful vintage knitting pattern for cardigans with fair isle motifs from 1950s. There are instructions for sail boats, Scottie dogs and flowers. Knitted in vintage 3ply that will knit well in modern 3ply, but you can try modern 4ply and change needles to get the correct tension - always work a tension square. To fit 2-4 years or 23-24 inch chest or 4-6 years and 24-25 inch chest. Not charted. Bestway 3865: Great vintage knitting pattern child's picture knit jumper with motifs 1950s. This pattern has instructions for little round neck long sleeved jumper with scottie dog, flower or chicken motifs around the bottom above the welt. Worked in double knitting, always work a tension square and change needles to get the correct size if needed. Bestway 3912: Great vintage knitting pattern from the 1960's with Harold Hare and Teddy Bear from the comic. Knitted in double knitting, work a tension square to see if you need to change needles. To fit chest 23"-25" and 25"-27" or 3-7 years. Bestway 3984: Great vintage baby romper knitting pattern from 1950s. This little chap is wearing a simply gorgeous romper knitted in vintage 3ply, try modern 4ply to see if you need to change needles. Always work a tension square. The motif can be knitted in fair isle or knitted plain stocking stitch and a purchased motif sewn one when finished. The rug is knitted in Big Ben which was chunky yarn and measures 24 x 30 inches. Copleys 1712: Great vintage boy's jumper with reindeer motifs from 1940s. This super picture knit sweater design is knitted in vintage 4ply, always work a tension square and change needles if needed. To fit 28 inch chest. Suggested to knit in scarlet with navy and white at yoke. Great Christmas jumper! Not charted. Copley 3111: Great vintage fair isle knitting pattern for girl's set from 1940s. This set includes mittens, scarf, beret and bonnet in fair isle with robins and holly, fabulous set for a Christmas present. There are also instructions for V neck sleeveless pullover. This set would also suit a little boy. To fit 4 years old or 24 inch chest and worked in vintage 3ply so try modern 4ply in a tension square. DL-1. Great vintage Mickey Mouse jumper cardigan babies set 1949. This lovely set worked in vintage 3ply, so try modern 4plyin a tension square is to fit 2-3 years 23 inch chest. Little trousers included. The jumper has Mickey Mouse all round the bottom, chart included. DL -2. Great vintage Donald Duck sleeveles pullover vintage knitting pattern 1949. This lovely little top is worked in vintage 3ply, so try modern 4plyin a tension square is to fit 4-6 years 25 inch chest. Chart included. Ducks go all the way round! DL -3. Great vintage Mickey Mouse beret set 1949. This lovely set worked in vintage 3ply, so try modern 4ply in a tension square. The beret is 9.5 inches across crown and the mittens are 6 inches around palm of hand. The beret has Mickey Mouse all round the crown, and on the cuff of the mittens. Chart included. Very Retro - I had a set like this when I was little - I belonged to the Mickey Mouse Club!! DL-4: Great vintage knitting pattern childs Mickey and Minnie Mouse cardigan 1949. To fit 5-7 years chest 26 inches. Worked in vintage 3ply, so try modern 4ply in a tension square. Emu 8056: Great vintage picture knit baby knitting pattern for cardigan with fair isle motifs - soldier, bambi, children. Knitted in vintage 4ply, work a tension square to see if you need to use double knitting or larger needles to get size required. To fit chest 20"-23". Emu 8082FC: Great baby fair isle cardigan vintage knitting pattern. This is a super little pattern with three differnt designs for baby. Donkey, boats and cute rabbits with pompom tails! To fit 20-23 inch chest around about 9-18 months. Always work a tension square. Worked in double knitting so easy to knit and quick for that late Christmas girft. Golden Eagle879: Fabulous vintage baby knitting pattern for fair isle set from 1940s. Bonnet and jacket with rabbits on and pom-poms so retro this one, super! Small chart includede, to fit chest 19 inches. Worked in vintage 3ply so try modern 4ply in a tension square and change needles if needed. Where it says to make pompom with cardboard circle the size of a penny remember that an old penny was much bigger than the one we have now, it would be nearer the size of two pound coin. Golden Eagle 1136: Lovely fair isle outdoor set for little folk. This sweet outfit is knitted in double knitting wool, but still work a tension square and change needles if needed. The beret and mittens have rabbits on too! To fit 1-2 years or 23 inch chest. Zip closing on jumper. Not charted. Greenock 402-1FC: Great vintage fair isle Norwegian style cardigan baby vintage knitting pattern. Thses two lovely designs is to fit 22 inch chest around one year old and is worked in vintage 3ply so try modern 4ply in a tension square. Very cute! There is also a jumper with trains on for a little boy. Greenock B457: Great vintage boys jumper knitting pattern with collar and embroidered motifs 1940s. There are Teddy bears or drumming soldier boys to go round the edge. These are Swiss embroidered but as there is a chart for each you could always work them as fair isle. To fit 24 inch chest and is knitted in modern 4ply. Greenock 757: Great vintage teen boy's or girl's slash neck jumper knitting pattern with reindeer from 1950s. This super design is in the best Scandinavian tradition, with Nordic borders and the super reindeer motifs - just ready for Christmas. Charted. To fit 32, 34, 36 and 38 inch chest/bust, being actually 2 inches larger when finished. Knitted in double knitting, always work a tension square. Lavenda 908: Great vintage baby pram set knitting pattern with zip jacket and fair isle duck border 1950s. This pattern is for a jacket with zip, gloves with thumbs and a helmet along with trews or pullups to fit 24 inch chest. Knitted in double knitting yarn. Lavenda 1010FC: Great vintage child's knitting pattern for jumper and cardigan with trains intarsia 1940s. This is a lovely 1940 pattern that was later reissued in colour. To fit 2-4 years, (23 inch chest) There are instructions for a jumper and cardigan in vintage 3ply, so try modern 4ply in a tension square and change needles if needed. Lavenda 1010: Great vintage knitting pattern for boys cardigan and jumper set. Trains! Every little boys dream! Before X-Men and X-Box! Here we have a sweet little cardigan in vintage 3ply with trains round the bottom - cardigan and jumper to fit 23 inch chest. pattern has crease down front otherwise claen and sound. Try modern 4ply for better size fit. Lavenda 1036: Great vintage baby fair isle cardigan knitting pattern 1940s. There are instructions for a little button up cardigan to fit 2-4 years. Little ducks or rabbits decorate the border, to fit 23 inch chest. Always work a tension square. These little cardigans are knitted in vintage 3ply, so try modern 4ply for size stated or modern 3ply for a smaller size.The back page has pictures of patterns that were available at the time. Pattern for sale is in slightly worn vintage condition with a few surface scuffs. Lavenda 1066: Great vintage child's fair isle knitting pattern for cardigan, beret and mittens with golly motif 1940s. This seet is knitted in vintage 2ply so try modern 4ply. To fit 3-5 years or 24-26 inch chest and 26-28 inch chest. The beret has gollies going round the top, the cardigan has one on each side of the front and mittenson on the back each mitt. Very sweet. Lavenda 1075CF: Great vintage girl's short sleeved fair isle jumper knitting pattern 1940s. This lovely pattern is to fit 8-10 years, 26-28 inch chest and is knitted in vintage 3ply, so try modern 4ply in a tension square and change needles if needed. Colours suggeted for this gay little jumper are red, green, yellow, pink, black an white, navy and blue. Not charted. Always work a tension square. Lee 269: Great vintage boys jumper knitting pattern with guardsman round bottom from 1950s. This super pattern is to fit 5 year old boy 24-26 inch chest. Always work a tension square and change needles to get correct tension. Knitted in vintage 4ply. Not charted. Marriners 157: Great vintage childs cardigan sunsuit 1950s. Great pattern with rabis with pom-pom tails. This little set will fit 1-3 year old in two sizes 22 inch chest and 24 inch chest. Worked in vintage 3ply try modern 4ply for stated sizes or modern 3ply for smaller sizes. 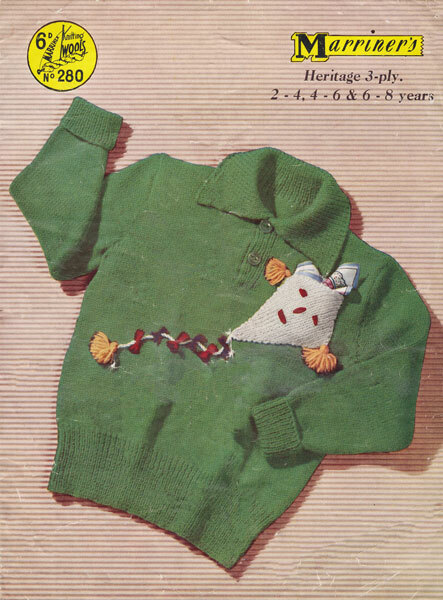 Marriners 164: Great vintage jumper knitting pattern for boys and girls with motif from 1950s. This little jumper has an owl motif knitted into it at the shoulder and is double breasted with off centre buttons. This design can be used as a bed jacket for junior or a great playtime jumper cardigan. To fit 2-4 years (24 inch chest) 4-6 years (26 inch chest) 6-8 years (28 inch chest). Knitted in vintage 3ply, so work a tension square in modern 4ply and see if you need to change needles. Has a chart. Marriners 252: Fabulous intarsia or picture knitting pattern for a little coat and hat to fit 2-3 years and 3-4 years with little scottie and westie on leads.1955, knited in vintage 3ply so will probably work in modern 4ply, use tension square to adjust needle size if needed. Little bells could be added to the collars of these sweet little dogs. Marriners 257: Vintge knitting pattern for childs sun suit set. Great vintage intarsia or picture knit pattern. Here is the elephant one! Great little cardigan and sunsuit - great for those winter breaks or get ready for those hot summer days by the sea! Pattern has instructions for 2 years and 3 years, chest measurements 22" and 24" knitted in vintage 3ply so try modern 4ply and see if a change of needles is needed. These motif cardigans are great additions to any modern babies wordrobe - dare to be different, this one has a little bell on the end of his trunk. 1957. Marriners 280: Great vintage childs jumper knitting pattern 1950s. This one has a kite with tassels and free bows. Worked in vintage 3ply so try modenr 4 ply. To fit 1-8 years in 3 sizes, 22, 24, and 26 inch chest. Marriners 364: Great vintage child's fair isle bordered cardigan knitting pattern 1950s. From the lovely Marriners patterns, this little cardigan is so simple to knit in 4ply with a flower border and little pockets. To fit 2-4 and 4-6 years. Always work a tension square and change needles if needed. I love these patterns and this is one from my vast collection. Marriner 850: Vintage knitting pattern with intarsia or pictures of little rabbits with pom-pom tails, great patterns with two designs. This one is in vintage quickerknit, so try tension square in modern 4ply or double knitting and change needles to get the orect size. To fit 20", 22", and 24" chest. Marriner 962: Great vintage child's cardigan with dog motifs 1960s. There are instructions to fit 24, 26, 28 inch chest in double knitting yarn. This little jacket has a collar and nice big buttons. Maygroves-1C:Great vintage knitting pattern for little girl's cardigan with teddy bears around the bottom 1940s. This pattern is knitted in vintage 3ply, so try tension square in modern 4ply. To fit 26 inch chest or 4-6 years. Maygroves-2C: Great vintage knitting pattern for little boys cardigan with drummer boys around the bottom 1940s. This pattern is knitted in vintage 3ply, so try tension square in modern 4ply. To fit 26 inch chest or 4-6 years. Maygroves-5C: Great vintage cardigan knitting pattern with motifs from the 1940s. This little duo has mostifs , the button up has humpty dumpty and fits 6-8 years 25 inch chest and is in a mock cable. The other little cardigan is to fit 4-6 years and has Christmas Trees ad snowman at the bottom just above the rib. To fit 25 inch chest or 4-6 years. 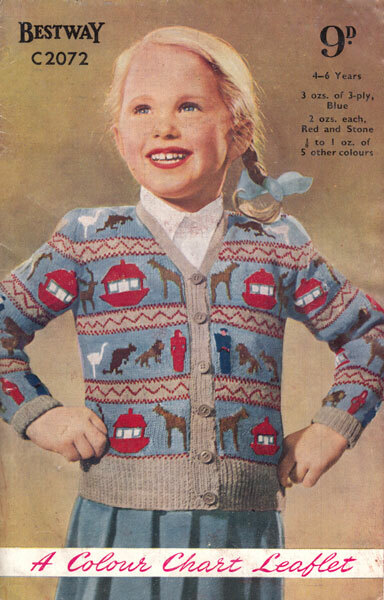 Maygroves-14C: Great vintage little girl's bolero knitting pattern from the 1940s. This little pair have chicks or ballet dancers on them - so sweet. The ballet dancer one is to fit 5-7 years or 25-27 inch chest and the one with chicks is to fit 3-5 years or 21-22 inch chest. They are easy to knit and are in worked in vintage 3ply - always work a tension square and try this design in modern 4ply. Very cute. M&C 96: Fabulous 1930's boy's or girl's cardigan and beret set knitting pattern. With anchors and sail boats, very topical at the time, this little lad looks a bit fed up, but his outfit is super. To fit 2-3 years in vintage 3ply so try modern 4ply yarn in a tension square. Colour suggested are navy blue, light blue, white and red, beret to match. Not charted. Patons 414FC: Great vintage little girl's jumper knitting pattern fair isle pictures 1940s. This cute little jumper has a house and dancing people round the bottom and the round yoke has more dancing people, and even on the sleeve above the cuff is a little person. Knitted in vintage 3ply, so try modern 4ply in a tension square and change needles if needed. To fit 3-4 years or 23 inch chest. Colours suggest yellow ground with small amounts of green, blue, burn brick and brown for the intarsia. Charted. Patons 665CF: Fabulous vintage knitting pattern with Peter Pan characters on childs jumper 1950s. Worked in vintage 3ply so try modern 4ply for this pattern and adjust needles to get the correct tension. Written instructions to work design not a chart this time. To fit 12-14 years, 29 inch chest. See further down page for a Weldon pattern also Peter Pan design. Patons 722: Great vintage knitting pattern 1950s. This fabulous pattern is for a plain knitted jumper with round neck in double knitting to fit 3-6 years (23, 25, 27 inch chest) and embroider the motifs on afterwards, There are instructions to embroider a coach and horses, yeoman and a crown on finished jumper. Patons 749: Great vintage knitting pattern for a child's fair isle jacket with Dutch figures 1950s. Knitted in vintage 3ply, so try modern 4ply in a tension square and change needles if needed. To fit 28 inch chest. Patons C795: Great vintage toddlers outdoor suit knitting pattern with monkey faces in fair isle 1950s. This little outfit is knitted in double knitting, but still work a tension square and change needles if needed. To fit 2-3 year olds or 22 inch chest. Small chart for monkey face. There are instructions for the zip jacket, hood and trousers. Patons 932FC: Great vintage knitting pattern for little girls jumper with ducks and rabbits 1940. This little pattern has two designs, both knitted in vintage 3ply, so try modern 4ply in a tension square. This one is the one with ducks and is to fit 2-3 years (22 inch chest) no chart for this one. Patons 1194: Great vintage knitting pattern for childs picture knit jumper 1950s. These great jumpers have elephant, camel and sailors on the front and back with charts. To fit 4-9 year olds (24, 26 and 28 inch chest. )They are knitted in Big Ben which was similar to modern chunky with a tension of 3.5 stitches to an inch and 4.5 rows knitted on old size 3 (6.5mm). Penelope 1354: Great vintage knitting pattern. Polo neck for a horse mad little girl, great for riding out on those chilly mornings. 1950 pattern, in vintage 3ply wool for girls 10-12 years chest 30" (try tension square and adjust - modern 4ply might work better for size).Great for surprise Christmas gift. See further on this page for a Wendy pattern with Horses head design.